Ok – back to the main clause. My first stop was Goldhawk Road. 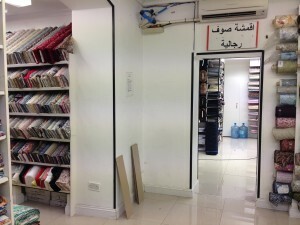 (Take a look here for Aoife’s latest visit). I dumped my suitcase at the Costa Coffee (no product placement intended) and started working my way up the street. 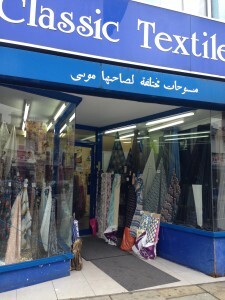 I didn’t manage to see get to all the shops but made sure to include my favourite – Classic Textiles. I had read online about the “Save 30-52 Goldhawk Road from demolition” campaign and asked them for an update. If you’re interested – they’ve just lost the most recent court battle with the local council (who want to tear down all the shops and build apartments), but are confident of winning the next – “And we’ll go to Europe if necessary”. 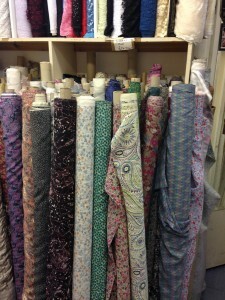 The haul – I got a lovely Liberty silk. Isn’t it divine? Every now and then, I take it out and just gaze. 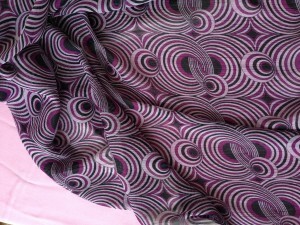 I also got this cool retro chiffon. 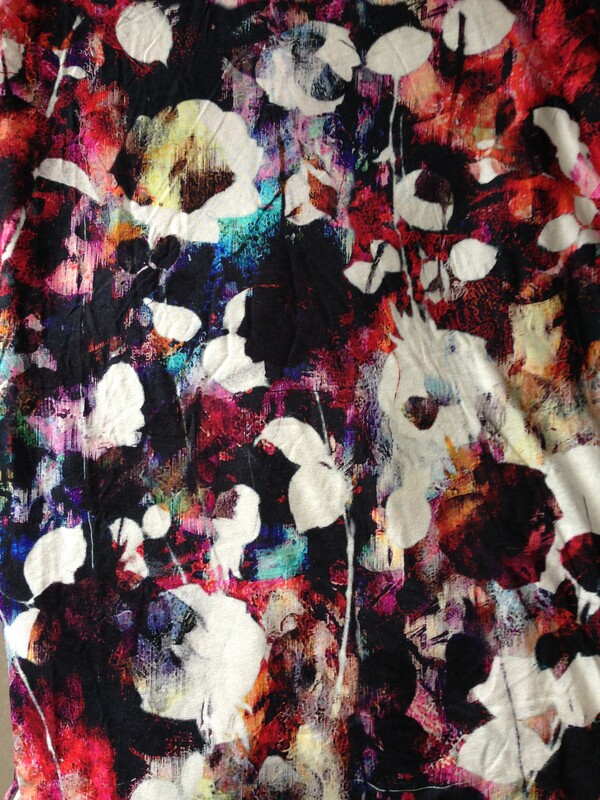 It was a total bargain – I think £3 a metre. I got 4m, just to be on the safe side. I’m thinking of making the Colette Crepe with it. 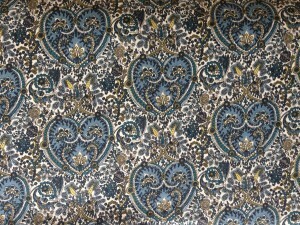 I also got a paisley wool Liberty, with the Colette Beignet in mind. I love my denim Beignet (see it here). The only thing stopping me is all those damned buttons. I can’t remember the price of those Liberties. I think they generally range from £15 to £20, depending on the fabric type. It’s so much cheaper than Dublin (you can see why Goldhawk is a must for us Irish). My second London trip was just last weekend and my first stop Shaukat. 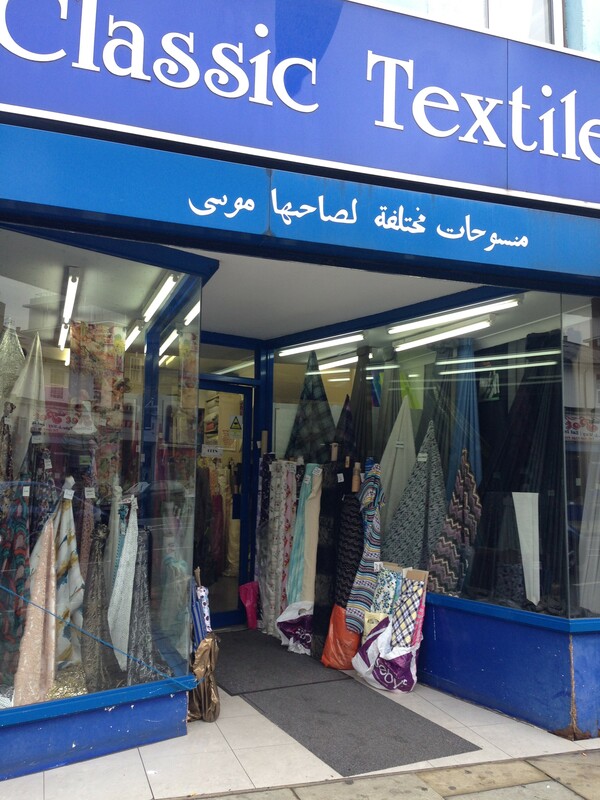 Aoife came across this shop online and it looked fab. The website is pretty impressive so in the selfless cause of research, I went to check it out. Saturday was a beautiful sunny day and it was a lovely walk from the tube station through leafy Knightsbridge to the Old Brompton Road. Here are a couple of pics of the outside and indoors. This place is huge. It was practically empty and eerily orderly. 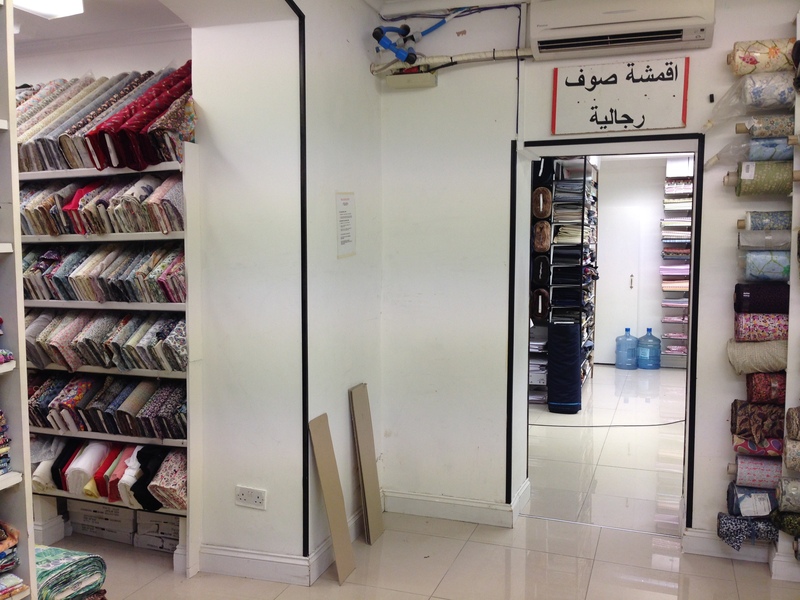 I wandered through a series of interlinked rooms, filled with all sorts of fabric and Middle Eastern headshawls. There was also a hidden away alcove with shelves and shelves of old-fashioned “slips and briefs” – does anyone wear them anymore.. ? Lots of choice – I love the polka dots. Given my self-imposed purchasing ban, I didn’t get anything (smug, self-congratulatory smile) but checked out the remnants basket before I left, arguing that a bargain doesn’t count as an actual purchase. 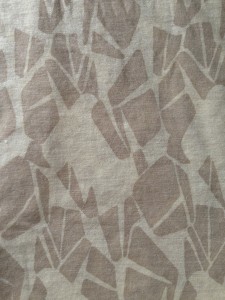 The remnants section consisted of neat ¼ and ½ metre pieces of fabric, at the same price per metre as the rolls. See what I mean by eerily orderly?! I headed back on the tube. Next stop Berwick Street. (It’s about a ten minute walk from Piccadilly Circus tube station). Berwick Street. These shops are fancy and polished. 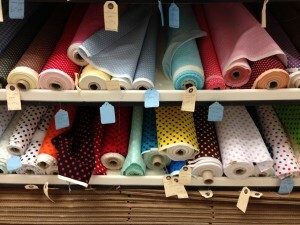 While you won’t find yourself climbing through tangles of rolls here, there are lots of funky fabrics. Think beaded, feathered extravaganzas, patterned suedes, Chanel wools… The colours, textures, prints are gorgeous. 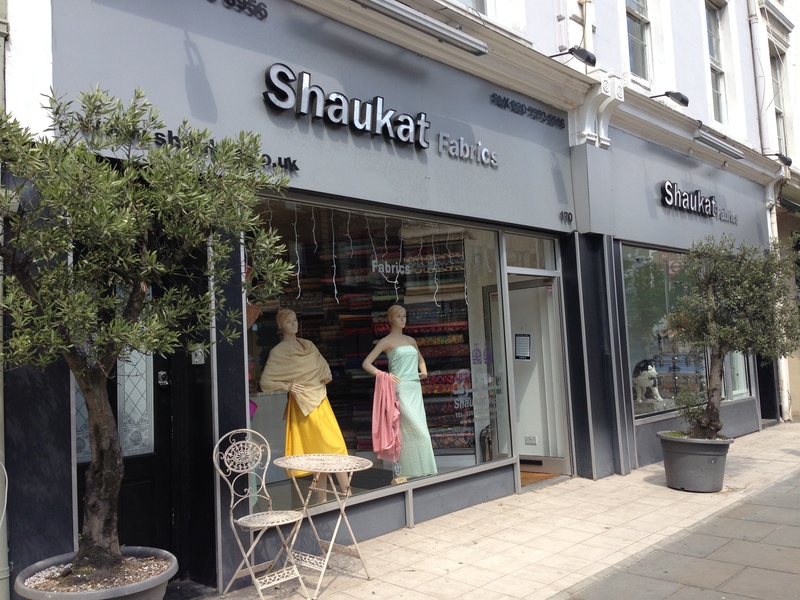 If Goldhawk Road is a carnival, this is an art gallery. 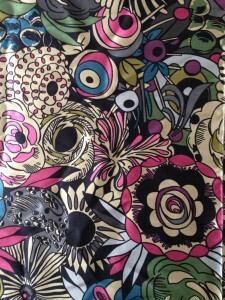 The price is also artistically designer. 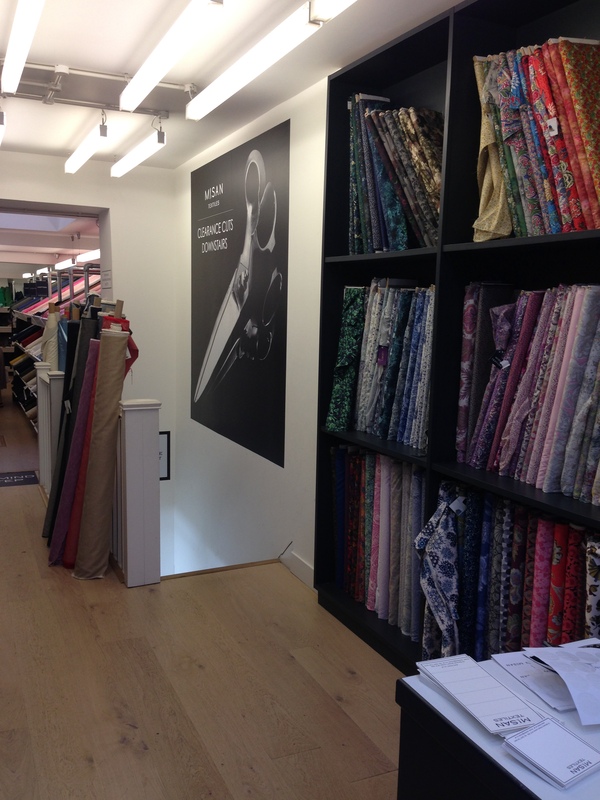 Expect to pay anything from £30-£80 a metre. On a previous trip I splashed out on a beautiful silk jersey, my most expensive fabric purchase ever, and a lovely black stretch lace. I haven’t actually made anything from them yet.. These shops don’t entertain grubby sales racks. 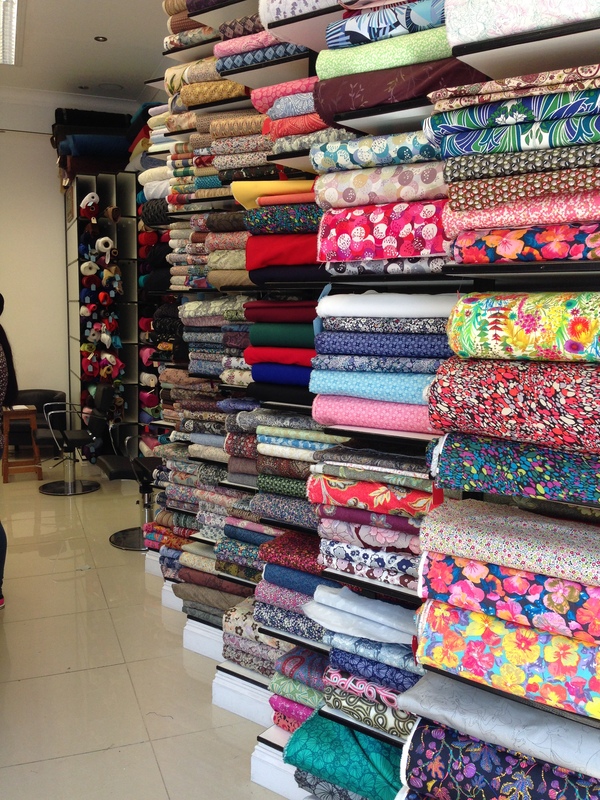 However there are a couple of (semi)bargain places – I was directed to an upstairs shop that sells remnants from a few of the shops (I – er – forget the number. You’ll find it if you’re interested though) and the Misan (one of three) at No. 50 which has a clearance basement. Here’s a pic. If you go to Berwick Street, include this in your trip. 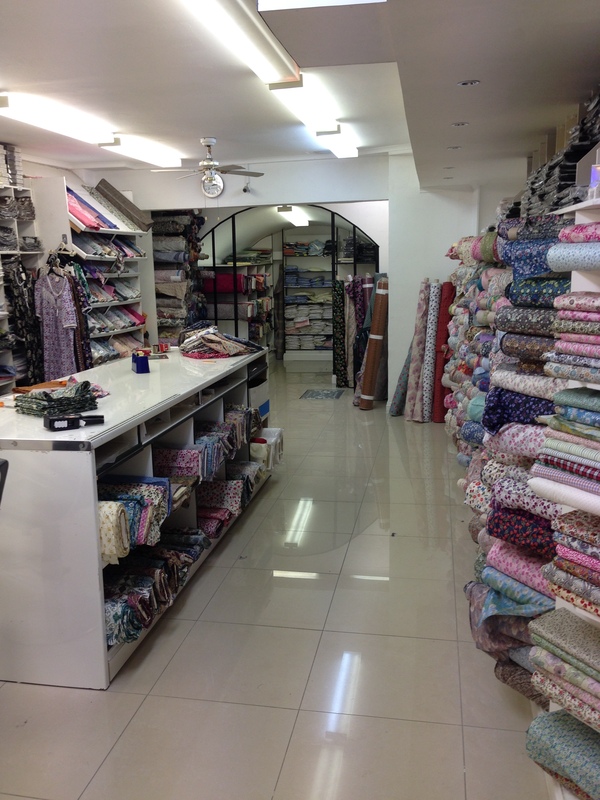 There are lovely fabrics at good prices, and plenty of healthy disarray too. 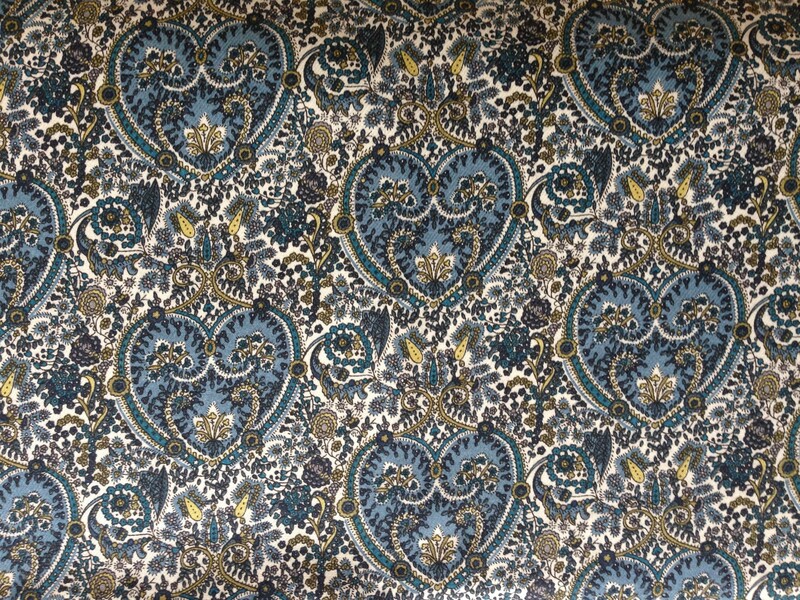 I got this lovely 3metre piece of soft, fine wool for £35. 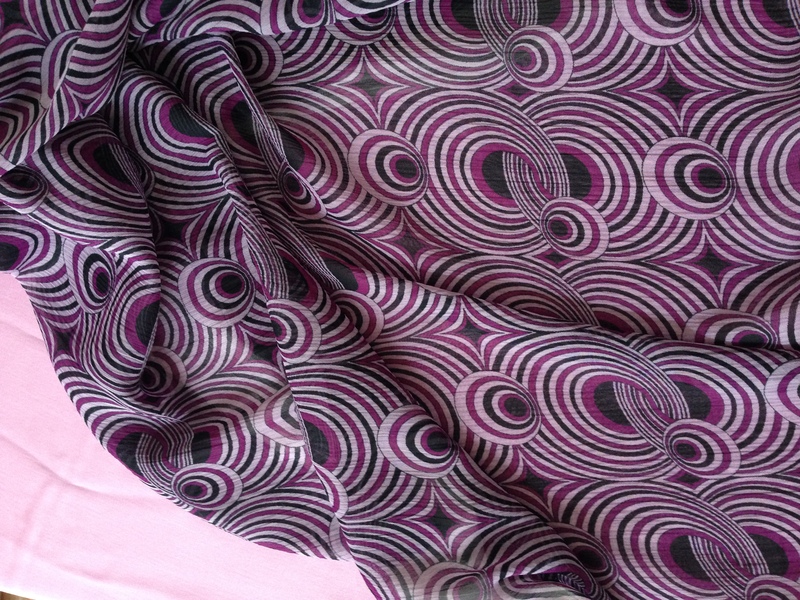 I’m still mulling over what I’ll do with it – a scarf maybe (would make a lovely gift) or a nice, soft t-shirt. The other find is this divine piece of stretch cotton. The 3m piece was £30. I immeiately loved it, as did my teenage daughter. There’s a definite plan – the Washi in a maxi style. I can’t wait to get going on it. I’ve been dying to make the Washi for a while. So – you see – a purchase with a 100% definite plan. Meet the new me. This entry was posted in London, Shopping, Where to shop by Sinead. Bookmark the permalink. 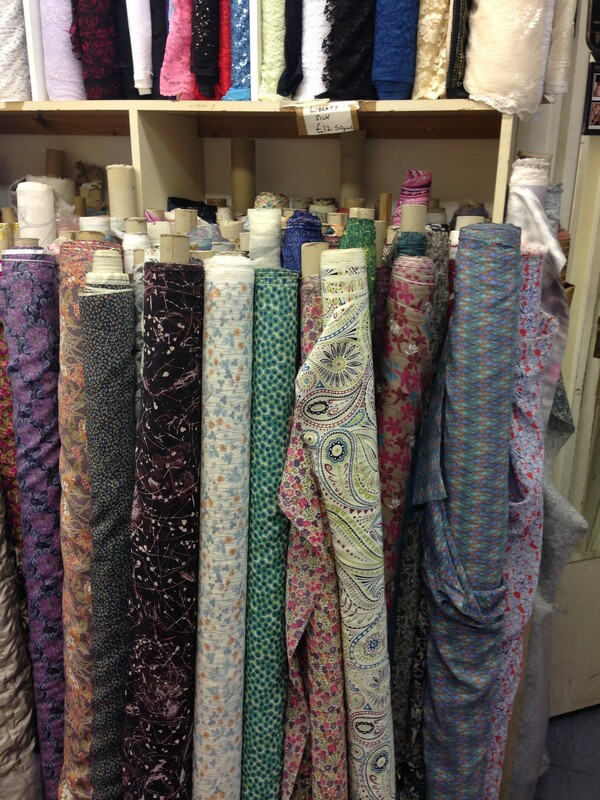 Have been fabric shopping in London too. Was glad to see that I hadn’t missed anything – hit the same spots you did!